[S118] Census - 30 Mar 1851, UK census, ED 6 HO107-1503 Folio 141 p41 GSU roll 87837. [S667] England & Wales Non-Conformist & Non-Parochial Registers 1567-1970, at http://www.ancestry.co.uk, RG4 Piece 4262: City Road, The Tabernacle (Independent), 1768-1840. [S367] Census - 2 Apr 1871, UK census, ED 4 RG10-1702 Folio 62 p26-27 GSU roll 830749. [S178] Census - 5 Apr 1891, UK census, ED 5 RG12-179 Folio 145 p33. [S190] Index - GRO and Office of National Statistics, England & Wales Civil Registration Qtrly Indexes, Death: District of Hackney, Vol 1b, p261, aged 78. [S677] Index - England High Court of Justice, England & Wales National Probate Calendar, probate granted in London to George Freeman EVANS warehouseman and Charles Matthew HALL, boot-manufacturer. [S714] World War 1 Australian Service Records, at http://www.naa.gov.au/collection/explore/defence/…, Series B2455, item barcode 7984073. [S926] BDM NSW Registry, birth record, Reg. No. 49794/1915. [S116] Census - 3 Apr 1881, UK Census, ED 4 RG11-0282 Folio 28 p22 FHL film 1341061. [S119] Family Bible - Thomas Spencer Forsaith bible. [S190] Index - GRO and Office of National Statistics, England & Wales Civil Registration Qtrly Indexes, Marriage: District of Hackney, Vol 3, p172. [S118] Census - 30 Mar 1851, UK census, ED 4 HO107-1503 Folio 85 p27 GSU roll 87837. [S367] Census - 2 Apr 1871, UK census, ED 2 RG10-309 Folio 77 p38 GSU roll 818890. [S514] Newspaper - Daily News, Issue 10934 of 3 May 1881 and 10935 of 4 May. [S190] Index - GRO and Office of National Statistics, England & Wales Civil Registration Qtrly Indexes, Death: District of Hackney, Vol 1b, p278. [S677] Index - England High Court of Justice, England & Wales National Probate Calendar, administration granted in London to Edith Madeline FORSAITH, spinster; this gives a death date of 3 May. [S190] Index - GRO and Office of National Statistics, England & Wales Civil Registration Qtrly Indexes, Birth: District of Hackney, Vol 3, p211, 2Q1850, mother's maiden name MITCHELL. [S190] Index - GRO and Office of National Statistics, England & Wales Civil Registration Qtrly Indexes, Birth: District of Hackney, Vol 3, p226, 3Q1851, mother's maiden name MITCHELL. [S190] Index - GRO and Office of National Statistics, England & Wales Civil Registration Qtrly Indexes, Birth: District of Hackney, Vol 1b, p287, 1Q1857, mother's maiden name MITCHELL. [S190] Index - GRO and Office of National Statistics, England & Wales Civil Registration Qtrly Indexes, Birth: District of Hackney, Vol 1b, p291, 4Q1858, mother's maiden name MITCHELL. [S926] BDM NSW Registry, birth record, Reg. No. 14515/1892. [S160] National Archives Film - NSW Pioneers Index; microfiche, Entry no. 14515. [S928] BDM NSW Registry, marriage record, Reg. No. 15516/1922. [S160] National Archives Film - NSW Pioneers Index; microfiche, Entry no. 15516. [S284] Index - New South Wales BDMs online, at http://www.bdm.nsw.gov.au, Death Reg. No. 30484/1964. [S667] England & Wales Non-Conformist & Non-Parochial Registers 1567-1970, at http://www.ancestry.co.uk, England & Wales, Non-Conformist and Non-Parochial Registers, 1567-1970, Piece 3999: Bunhill Fields Burial Ground, City Road, 1832-1838. [S667] England & Wales Non-Conformist & Non-Parochial Registers 1567-1970, at http://www.ancestry.co.uk, RG4 Piece 3995, Bunhill Fields Burial Ground, City Road, 1819-1822. [S915] GRO England & Wales, marriage record, District of Stoke Dameral, Vol 5b, p617, no. 122. [S871] FamilySearch, at https://familysearch.org/, FHL film 254485, England, Births and Christenings, 1538-1975. [S367] Census - 2 Apr 1871, UK census, ED 4 RG10-2129 Folio 16 p25 GSU roll 832030. [S340] Census - 7 Apr 1861, UK census, ED 3 RG9-1449 Folio 93 p2 GSU roll 542814. [S117] Census - 6 Jun 1841, UK census, ED 13 HO107-133-3 Folio 21 p4 GSU roll 241258. [S190] Index - GRO and Office of National Statistics, England & Wales Civil Registration Qtrly Indexes, Marriage: District of Liskeard, Cornwall, Vol 9, p195, 4Q1849. [S118] Census - 30 Mar 1851, UK census, ED 1b HO107-1901 Folio 22 p3 GSU roll 221052. [S926] BDM NSW Registry, birth record, Reg. No. 13404/1885. [S926] BDM NSW Registry, birth record, Reg. No. 14727/1888. [S190] Index - GRO and Office of National Statistics, England & Wales Civil Registration Qtrly Indexes, Death: District of Stoke Damerel, Vol 5b, p227, 1Q1877, aged 57. [S116] Census - 3 Apr 1881, UK Census, ED 4 RG11-2206 Folio 83 p27 GSU roll 1341531. [S178] Census - 5 Apr 1891, UK census, ED 6 RG12-1739 Folio 64 p55 GSU roll 6096849. [S190] Index - GRO and Office of National Statistics, England & Wales Civil Registration Qtrly Indexes, Marriage: District of Stoke Dameral, Vol 5b, p602, 4Q1883. [S190] Index - GRO and Office of National Statistics, England & Wales Civil Registration Qtrly Indexes, Death: District of Stoke Damerel, Vol 5b, p184, 3Q1892, aged 62. [S430] Census - 31 Mar 1901, UK census, ED 30 RG 13-2096 Folio 27 p45. [S677] Index - England High Court of Justice, England & Wales National Probate Calendar, probate granted in London to John MITCHELL, plumber and James SMITH, dockyard-labourer. [S190] Index - GRO and Office of National Statistics, England & Wales Civil Registration Qtrly Indexes, Death: District of Plymouth, Vol 5b, p179, aged 77. 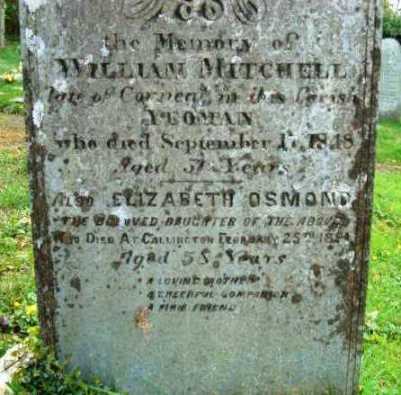 William died before July 1853 in England. [S190] Index - GRO and Office of National Statistics, England & Wales Civil Registration Qtrly Indexes, Birth: District of Liskeard, Vol 9, p9, 1Q1851, mother's maiden name CRADICK. [S680] Cornwall Online Parish Clerk database, at http://www.cornwall-opc-database.org, baptism of William, parents John and Jane MITCHELL of Bathpool. [S680] Cornwall Online Parish Clerk database, at http://www.cornwall-opc-database.org, parents John and Jane MITCHELL of Bathpool. [S871] FamilySearch, at https://familysearch.org/, England, Select Marriages, 1538-1973, FHL film 916953 & 1596066, p27. [S117] Census - 6 Jun 1841, UK census, ED 13, HO107-133-3, Folio 25, p12, GSU roll 241258. [S190] Index - GRO and Office of National Statistics, England & Wales Civil Registration Qtrly Indexes, Death: District of Liskeard, Vol 9, p85, 3Q1848, aged 51. [S901] Newspaper - Royal Cornwall Gazette Falmouth Packet, Cornish Weekly News, & General Advertiser, issue of 22 Sep 1848, Deaths. [S680] Cornwall Online Parish Clerk database, at http://www.cornwall-opc-database.org, resident of Corneal, aged 51. [S116] Census - 3 Apr 1881, UK Census, ED 45 RG11-1160 Folio 36 p12 GSU roll 1341284 erroneously claims he was born in Cornwall. [S926] BDM NSW Registry, birth record, Reg. No. 14515/1892; this entry claims he was born in Devonshire. [S422] Royal Navy Service Records, at http://www.nationalarchives.gov.uk/documentsonline/…, Service No. 4105b, National Archives catalog reference ADM/139/842 and ADM/188/43. [S190] Index - GRO and Office of National Statistics, England & Wales Civil Registration Qtrly Indexes, Birth: District of Tavistock, Vol 5b, p306, 3Q1853, mother's maiden name CRADICK. [S340] Census - 7 Apr 1861, UK census, ED 4 RG9-1526 Folio 71 p6 GSU roll 542826. [S367] Census - 2 Apr 1871, UK census, Royal Navy at sea HMS Narcissus RG10-5782, Folio 167, p27 GSU roll 895849. [S116] Census - 3 Apr 1881, UK Census, ED 45 RG11-1160 Folio 36 p12 FHL Film 1341284. [S716] NSW State Records, at http://www.records.nsw.gov.au/, "Persons on bounty ships to Sydney, Newcastle, and Moreton Bay (Board's Immigrant Lists)". Series #5317, Reel: 2495, image 30 & Series #5316, Reel: 2142, image 8. [S928] BDM NSW Registry, marriage record, Reg. No. 15153/1919 (marriage record). [S507] Family Bible - Evelyn Jessie Paul (nee Mitchell). [S590] Newspaper - Sydney Morning Herald, issue of 11 Sep 1918, issue 25174, p10, col 1, Deaths. [S927] BDM NSW Registry, death record, Reg. No. 10858/1918 (death record). [S928] BDM NSW Registry, marriage record, Reg. No. 15153/1919. [S284] Index - New South Wales BDMs online, at http://www.bdm.nsw.gov.au, Death Reg. No. 9705/1929. [S190] Index - GRO and Office of National Statistics, England & Wales Civil Registration Qtrly Indexes, Birth: District of Stoke Dameral, Vol 5b, p334, 3Q1875, mother's maiden name DUNSTAN.